If the track is not aligned correctly, it may result in binding, dragging, gaps or a stubborn door. If the track is loose, the door may even fall. However, these problems are usually not too difficult to fix, even if you do not have much experience. Is adjusting the track on your own worth the effort? Have a look at the garage door rollers. There is an elongated shaft that slides into the hinges. The rollers slide in the hinge, so the track does not have to be aligned to perfection. You should see 1/2″ to 3/4″ of the shaft. This will let the roller move in or out if necessary. If the track runs too close, the roller may bind against the hinge. In case the track runs too far, the roller will jump out of the hinge. If the door is difficult to lift or lower, you need to make sure the source of the problem is the track, the first thing. Unplug the opener and try opening and closing the door manually. If the door moves smoothly, then the problem is probably in the garage door operator mechanism. 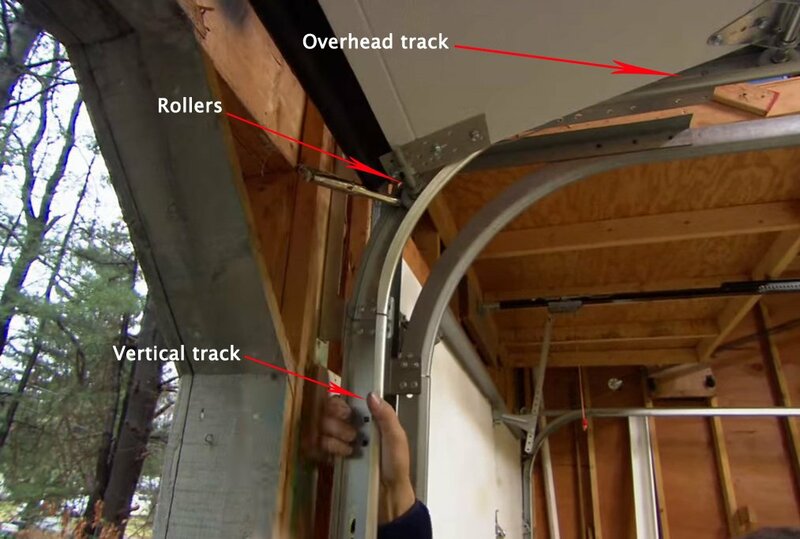 Adjusting the garage door track: this article explains how to correct the alignment on the overhead part of the track, as well as at the sides and the bottom. Replacing the garage door track may be necessary in case the track is bent or rusted. In most cases the answer would be yes. You only need a couple of basic tools (depending on the type of work) and basic skills. Also, it may require patience, especially if you are a novice. A garage door tech will adjust the track for $75-$100, so that is the sum that you save if you do the task by yourself. It will take a professional 20-30 minutes as it is a fairly simple job. If you adjust the garage door track the wrong way, the door may grow even more stubborn. However, if you were able to do the work in the wrong way, it means, that it is not hard for you to fix it, too. The door may fall if you try to loosen the overhead tracks while the door is raised. If you follow this safety rule, there is no risk involved.